The project team will be working at this location for the entire week. Members of the general public are welcome to walk in and observe at any time. More information is available here. 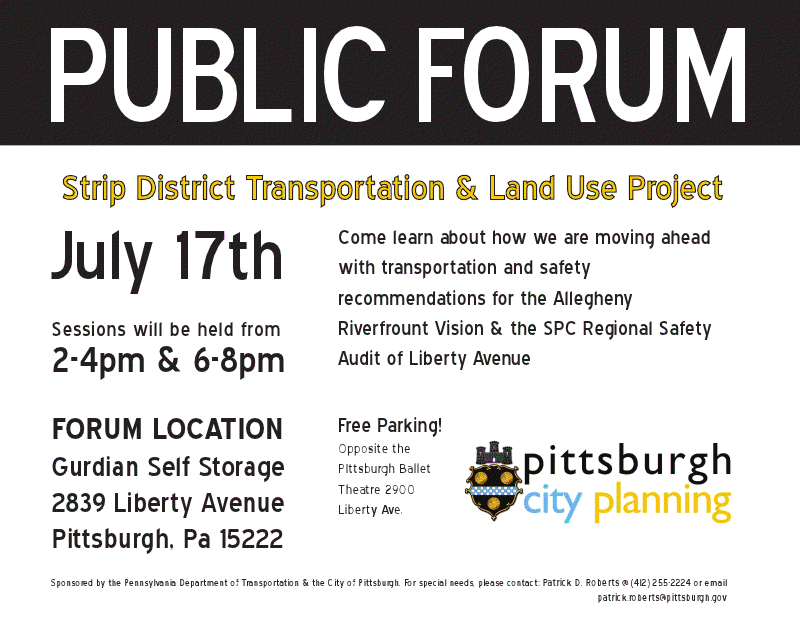 On Tuesday July 17, the City planning office will hold a public forum on the Strip District Transportation and Land Use Project. This is connected with the transportation and safety recommendations for the Allegheny Riverfront Vision and the SPS Regional Safety Audit at Liberty Avenue. This forum will take place at the Guardian Storage Building, 2839 Liberty Avenue (just outside of Polish Hill). Sessions will be held from 2:00 – 4:00 p.m. and 6:00 – 8:00 p.m.. Free parking is available opposite the Pittsburgh Ballet Theatre at 2900 Liberty Avenue. The Strip District Transportation and Land Use Project is meant to provide a level of feasibility for a series of transportation and safety improvements. Over the course of the project we will develop visualizations to help stakeholders “see” and experience the features and benefits of specific improvements, while maintaining an open line of communication in order to discuss trade-offs. On a more technical basis, future land use goals will be related to alternative funding strategies that can allow the City of Pittsburgh to move ahead with implementation, potentially without the need for major federal subsidy. Previous studies have recommended pursuing transportation improvements such as a streetcar connecting the Cultural District Downtown through the Strip District and into Lawrenceville. There are a number of recommendations for enhanced bicycle and pedestrian movements through the Strip. Recommendations have been made along Liberty Avenue, Penn Avenue and Smallman Street to address pedestrian safety. Movement and access for wholesale operations could be improved upon. Creating strong connections along 21st Street toward the river has been envisioned, and a new transit station at 21st Street along the Busway has been proposed. It has even been suggested that we re-introduce an Incline connecting the Hill District with the Strip District. What does that all look like? Where would it go? How do we pay for it? Those are some of the questions that we intend to address over the course of the next few months. The process includes the Issues Forum on July 17th and is centered upon a 6-Day Charrette Design Studio with multiple public engagements in September (September 10th-15th). Project updates will soon be available through Department of City Planning website. Please feel free to contact the Department of City Planning with any questions. Celebrate the start of the holiday season today, Saturday November 12 (from 10:00 a.m. – 4:00 p.m) and Sunday November 13 (from 10:00 a.m. – 3:00 p.m.) during Heritage Holidays Weekend at the Senator John Heinz History Center. 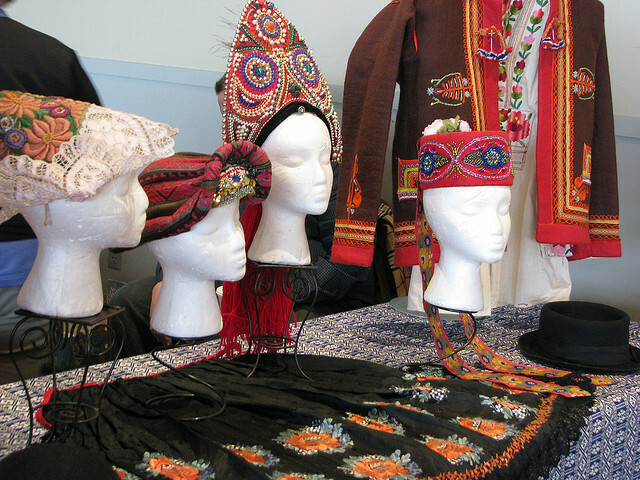 Join hundreds of visitors and share the rich traditions of our region’s cultural diversity with live ethnic music and dancing, food samples, and hands-on activities with dozens of Western Pennsylvania ethnic and heritage groups. Visitors will enjoy entertaining performances in the History Center’s Great Hall and live cooking demonstrations in the new Weisbrod Kitchen Classroom throughout the weekend. Guest curator and local flag expert Dr. Peter Keim will lead behind-the-scenes tours of the History Center’s newest exhibition, Stars & Stripes: An American Story, beginning at noon on both Saturday and Sunday. Click here to view the full schedule of events. This event is free with regular History Center admission and free to History Center members. For more information, contact Natalie DeRiso at 412-454-6373 or nnderiso@heinzhistorycenter.org. 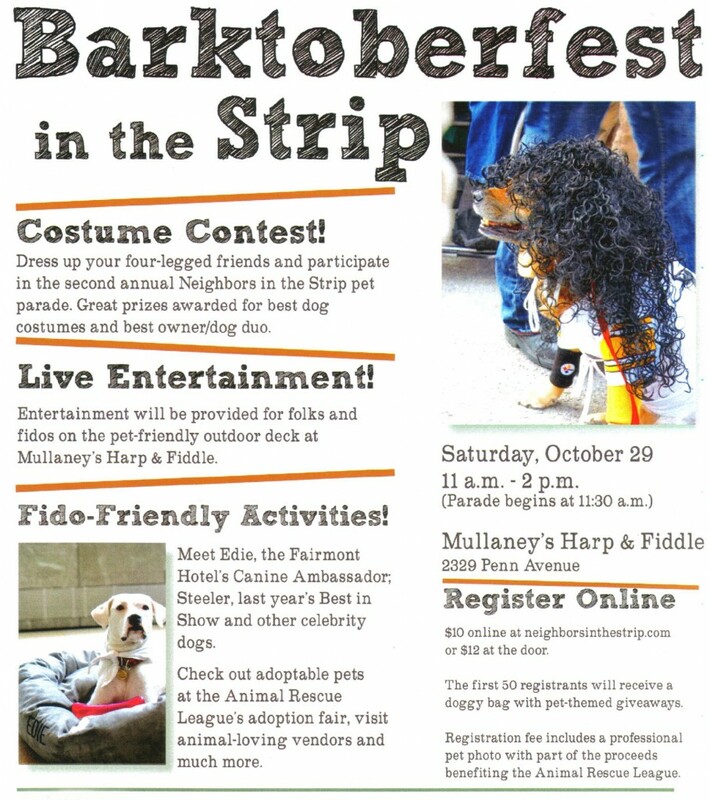 If you’re in the mood for a different sort of dog walk this Saturday, bring your pet to Mullaney’s Harp and Fiddle in the Strip District this Saturday at 11:00 to participate in the second annual pet parade. There will be prizes, entertainment, and activities. It’s $10 to pre-register online or $12 at the door. That price includes a professional pet photo, and the first 50 registrants get a bag of giveaways. 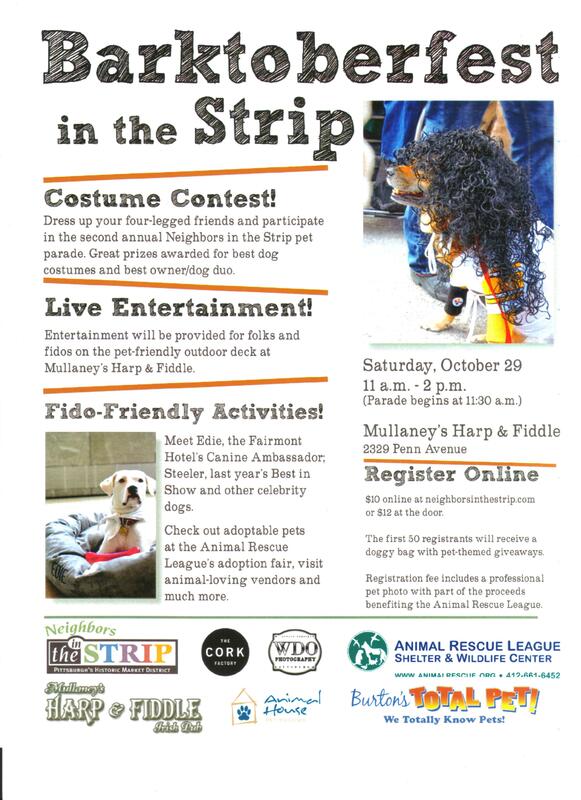 Proceeds from the event benefit the Animal Rescue League. For more information, contact Neighbors in the Strip by calling 412.201.4774. Click on the flier to see a larger image. Polish Hillarian, Brian Seckleki, journeyed beyond the neighborhood’s borders today, investigating rumors of a new shopping experience in the Strip District. And what did he bring back from his brief, albeit fruitful journey? The Public Market debuted today. But have no fear! The grand opening is taking place September 11-12. Details about vendors, hours and special activities and events can be found on their site. Carley Parrish and Shannon Pultz were selected by Sprout and the Strip District Community to create a mural on the side of the Hermanowski Building, located at 1907 Penn Avenue, near the corner of Penn Avenue and 20th Street in the heart of the Strip District. The design for the mural was inspired by ideas from the community and the history of the area as well as the art of Romare Bearden, who lived on Penn Avenue with his grandparents in the late 1920s. The artists are using the site as a journal for the production of the mural. It will be updated regularly with progress images. The artists will be working through September on the production of the mural. It is slated to be complete by late October. The mural is part of The Sprout Fund Public Art project, which has been bringing murals to communities all over Pittsburgh since 2003. Polish Hill has its own Sprout funded public art piece; a beautiful sculpture by Paul Bowden. If Saturdays in the Strip are not enough of a festival for you, welcome to Strip Fest! Right by Nature and Cioppino are taking it to the streets with Strip Fest on Saturday, July 31 from 2-6 pm at 23rd and Smallman Streets. Enjoy a full day of fun including live music, a BBQ pig roast, a beer wagon gig rig, red and white wine, lamb sliders, lobster rolls, product sampling and more! And, to make it even better, parking is free! Come down this Saturday and see how the Strip is growing! A percentage of the proceeds from this event will help support renovations for our historic landmarks, St. Patrick and St. Stanislaus Kostko Churches. The events are popular, with a party atmosphere among the aisles. The food’s good enough that it’s worth going just for that; but you can get some shopping done while you’re at it. In response to customer requests, Right by Nature is now stocking regular brands and products alongside the eco and wholefoods stuff. If you can’t make over, you can still shop…Right by Nature now offers free delivery. 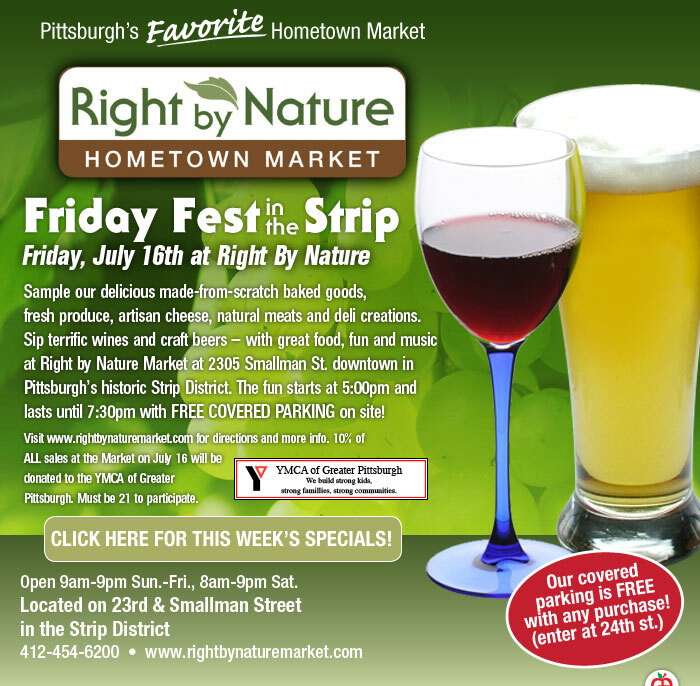 Free Happy Hour at Right Be Nature, 23rd and Smallman Street in the Strip District, 5:00 – 7:30 pm. Parking is right in the building, free with purchase, and there’s an elevator right down to the store. For more information, call 412.454.6200, or check the Right by Nature website. Right by Nature, the natural and whole foods grocery store that opened in the Strip in fall of 2008, has expanded to carry many more conventional products and brands, presents regular wine and food sampling events, and has become an essential resource for many residents in the area. Now, according to an article in the Post-Gazette, Right by Nature is adding a web-based grocery ordering and curbside pickup service, and, starting June 21, Downtown and Hill District area residents will be able to request home delivery, which will cost $4.95 with a minimum order of $35. It seems that at the moment, delivery is only available to Downtown and the Hill. But we’re right on the way to the Hill–perhaps residents can petition Right by Nature to expand their service! Many Polish Hill residents have long relied on the ShurSave in Bloomfield for most of their shopping. In recent years there have been persistent rumors that the ShurSave would be closed. At the same time, other stores are opening elsewhere that give our residents more options. Last November, Right by Nature opened at 2305 Smallman in the Strip and quickly became a popular destination. Apparently, another food market will be opening nearby. Last spring, it was announced that Salem’s Middle Eastern market and deli would be opening at 30th and Smallman. The banner on the building still says “Opening Soon”. There is no opening date or contact information on the banner, so we’re not sure when the market will be open for business. But watch this space–we are keeping an eye on it. It will be nice to have more nearby options.